WUWT is taking a short intermission from it's normal fare of utter nutter conspiracy theories. Anthony Watts copied and pasted a press release about oceans, the Arctic and Antarctica. He didn't understand what he copied and pasted, confusing the Atlantic Meridional Overturning Circulation (AMOC) with the Atlantic Multidecadal Oscillation (AMO). His headline read (archived here): "AMO fingered in newly discovered 200 year bipolar disorder lag". As you can probably guess, it wasn't the AMO that got "fingered", it was ocean circulation. The AMO is more or less just a pattern of sea surface temperature in the north Atlantic - a long way from Antarctica. The AMOC, on the other hand, is where currents overturn in the north Atlantic, off Greenland, effectively pumping water around the world. At least Anthony didn't put the word "claim" in front of his headline this time. The paper is from Nature. The work was a massive collaborative effort involving scientists and engineers from 28 laboratories around the USA. The researchers compared abrupt climate change in Greenland (Dansgaard-Oeschger events) with those in Antarctica (Antarctic Isotope Maximum). The changes in Greenland were much more dramatic than the echoes of those changes in Antarctica, which happened a couple of centuries later. The researchers already had good data from Greenland. They compared it with data from an ice core drilled in Antartica - which provided a record going back 68,000 years. They documented eighteen different abrupt events in Greenland over that time. They deduced that it was ocean currents that transmitted the changes right the way down to Antarctica, not the atmosphere. Here we use a recently drilled high-accumulation Antarctic ice core to show that, on average, abrupt Greenland warming leads the corresponding Antarctic cooling onset by 218 ± 92 years (2σ) for Dansgaard–Oeschger events, including the Bølling event; Greenland cooling leads the corresponding onset of Antarctic warming by 208 ± 96 years. Our results demonstrate a north-to-south directionality of the abrupt climatic signal, which is propagated to the Southern Hemisphere high latitudes by oceanic rather than atmospheric processes. The similar interpolar phasing of warming and cooling transitions suggests that the transfer time of the climatic signal is independent of the AMOC background state. Our findings confirm a central role for ocean circulation in the bipolar seesaw and provide clear criteria for assessing hypotheses and model simulations of Dansgaard–Oeschger dynamics. The bipolar seesaw theory explains certain abrupt episodes of climate change as a consequence of an interhemispheric redistribution of heat; when one polar region is warming, the other cools. So far, it has been unclear if the Northern Hemisphere is forcing the Southern Hemisphere or vice versa, and whether the seesaw operates via oceanic or atmospheric mechanisms. This study, synthesizing data from several climate laboratories, uses high-resolution data from the recently drilled WAIS Divide Antarctic ice core, combined with data from Greenland, to show that during much of the past 65,000 years, the north has led the south for both cooling and warming events. Abrupt Northern Hemisphere climate variations were followed two centuries later by a response in Antarctica, suggesting an oceanic propagation of the climate signal to the Southern Hemisphere high latitudes. So what does the intermediate timescale of ~200 years tell us? It’s important to recognize that there are reasons why one might expect either a “fast” propagation or a “slow” propagation of the Greenland climate signal to the Antarctic. The very large sea ice changes in the North Atlantic associated with D-O events would have an impact on the atmosphere, and this should propagate global signals almost instantaneously. Indeed, this must have occurred, or we wouldn’t have the evidence that we do for abrupt changes in places as far flung as China, India, or the tropical Pacific that are in phase with Greenland temperature change. Methane variations, which are probably of tropical origin, are in phase with Greenland temperature within about 20 years (e.g., Rosen et al., 2014). The ocean itself can propagate signals very fast, via adjustment of the upper ocean by fast Kelvin waves propagating along the ocean boundaries (e.g. Johnson and Marshall, 2002). For example, Schmittner et al. (2003), and Rind et al. (2001) both found that the North Atlantic signal in their models propagates to the South Atlantic region very quickly, appearing in subsurface waters with a time lag of only about a few decades. However, they also find a century or multi-century delay in the further southward propagation from the South Atlantic to the Antarctic across the Antarctic Circumpolar Current (ACC). Furthermore, the propagation time varies with the strength of the ACC as imposed in the model. Eric also comments on Heinrich events, down the bottom of his realclimate.org article. 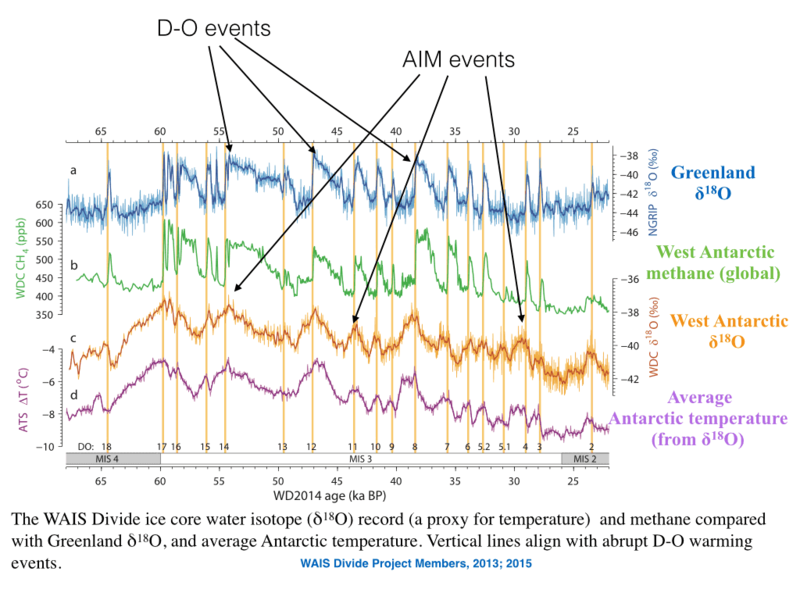 A remarkable ice core from Antarctica, with resolution down to "several decades"
The location of the ice core in Antarctica was chosen carefully. The scientists needed as much detailed information as possible. So they chose a site that had high snowfall. I imagine that wasn't that easy to find in Antarctica, which is the driest continent in the world. "Past ice core studies did not reveal the temperature changes as clearly as this remarkable core," said Eric Steig, a professor in the Department of Earth and Space Sciences at the University of Washington, who co-wrote the paper. Steig's laboratory made one of the key measurements that provides past Antarctic temperatures. "Previous work was not precise enough to determine the relative timing of abrupt climate change in Antarctica and Greenland, and so it was unclear which happened first," Steig noted. "Our new results show unambiguously that the Antarctic changes happen after the rapid temperature changes in Greenland. It is a major advance to know that the Earth behaves in this particular way." ..."The resulting information provides unprecedented detail about many aspects of the Earth's past climate," Taylor said. "This will provide a generation of climate researchers a way to test and improve our understanding of how and why global climate changes." OSU's Buizert said it is "very likely" that the Atlantic Meridional Overturning Circulation, or AMOC, is involved in these abrupt climate reversals. "This ocean circulation brings warm surface waters from the tropics to the North Atlantic," said Buizert, who is in OSU's College of Earth, Ocean, and Atmospheric Sciences. "As these water masses cool, they sink to the bottom off the ocean. This happens right off the coast of Greenland, and therefore Greenland is located in a sweet spot where the climate is very sensitive to changes in the AMOC." Brook said the AMOC seems to be critical, but was probably part of a combination of factors that ultimately controlled these past abrupt changes. "Although ocean circulation may be the key, there are probably other feedbacks involved, such as the rise and fall of sea ice and changes in ice and snow cover on land," Brook said. "There is probably some kind of threshold in the system -- say, in the salinity of the surface ocean -- that triggers temperature reversals. "It's not a problem to find potential mechanisms; it's just a question of figuring out which one is right. And the precise timing of these events, like we describe in this study, is an important part of the puzzle." It's this sort of paper that really brings home the enormity of the scientific research that goes on every day. Often unheralded. Some of the work must be painstakingly detailed. Some must test the patience of researchers. The rewards are reaped by us all, not just the scientists whose name appears on the paper. This just further accentuates the absurdity of the approach used in climate science. My take on it is that they take everything they know about the earth’s climate, add it all up, find a difference between their formulas and real-world measurements, and call the anomaly “man-made”. They could use the exact same strategy to say “God-did-it”, or blame the anomaly on unicorn farts. This isn’t science, it’s a rudimentary religion at best. What I don’t understand is that they are blaming a 200 year lag between Antarctica and Greenland, and they are blaming this two century gap all on Ocean circulation ? What baffles me,… how were they able to get absolute data spanning over 60,000 years that helped them make such a precise statement? “We needed a climate record from the Southern Hemisphere that extended at least 60,000 years into the past and was able to resolve fast changes in climate”! FTOP is just being silly, but gets the nod from WUWT deniers for being "clever". jorgekafkazar is a common WUWT-variety conspiracy theorist. And we all know how representative of the Antarctic West Antarctica is. …and most likely to give us the results we wanted. Fish & chips in the UK has run out, CO2 is to blame, the ice-core data proves it, cheque please! Off to the takeaway now! sarc off. There is a core of dumb deniers that hang around WUWT who just need to see their words appear in black and white. They don't understand the science so they can't write anything meaningful. They imagine that seeing their name in cyber-print somehow gives their life meaning. They become important. So what we see today, with the Antarctica ice extent high and the Arctic ice extent low, is no different than what has happened many times in the past. It could very well be just another natural cycle that has nothing to do with CO2. Isn’t the burden of proof on those who want to claim that this time is different? The Warmers only acknowledge that natural climate variability can slow warming. They use this to explain the “pause”. They are politically incapable of acknowledging the corollary that until proven otherwise, the Null Hypothesis that “climate change is natural and human contribution is insignificant” stands. The other asymmetry in their cant is that only the negative consequences of climate change may be discussed. The wonderfulness of longer growing seasons, more moisture in the air, and CO2 as important plant food cannot be mentioned, again, for political reasons that subvert their claim to be scientists. Just how “abrupt” where these events and what was the change in temperature? We are told that the temperature change that happened last century was unprecedented and therefore had to be human caused. I mean if the temperature has swung by 0.6 C over 100 years 18 times then what happened last century was just more of the same, right? or am I missing something? If DaveH ever travelled beyond WUWT, say if he'd ventured as far as realclimate.org, he would have found the answer. Many of the WUWT comments were complaining that the press release differentiated the past warming events that the scientists were studying, which were regional in nature, from the current global warming. Deniers don't want to accept the world is warming now. And they particularly object to the fact that it's us that's causing it. jorgekafkazar thinks the drilling site was chosen as being "most likely to give the results wanted", which credits scientists with a remarkably detailed understanding of the real processes (as opposed to the fake ones they're propagating) ofAntarctic ice formation over the last sixty-odd thousand years. An almost god-like understanding, in fact. This is why such people are so terrified of scientists. Scientists know what's really going on but use that knowledge for their own nefarious and communistic ends. At the same time they believe those scientists just fake the data anyway. It is what the psychiatrists/psychologists call projection. Bob Tisdale goes AMO-ing to a big chill - not! Judith Curry is unclear: is Jeb Bush too dumb? About that tropical "hot spot"
Description and code of TempLS V4 global temperature program.